Imagine a superfood -- not a drug -- powerful enough to help you lower yourcholesterol, reduce your risk of heart disease and cancer, and, for an added bonus, put you in a better mood. Did we mention that there are no side effects? You'd surely stock up on a lifetime supply. Guess what? These life-altering superfoods are available right now in your local supermarket. "The effect that diet can have on how you feel today and in the future is astounding," says nutritionist Elizabeth Somer, author of Nutrition for aHealthyPregnancy, Food & Mood, and The Essential Guide to Vitamins and Minerals. "Even people who are healthy can make a few tweaks and the impact will be amazing," Somer says. "I'd say that 50% to 70% of suffering could be eliminated by what people eat and how they move: heart disease, diabetes, cancer,hypertension can all be impacted." "Inflammation is a key driver of all chronic diseases, so blueberries have a host of benefits," says Ann Kulze, MD, of Charleston, S.C., author of Dr. Ann's 10-Step Diet, A Simple Plan for Permanent Weight Loss & Lifelong Vitality. 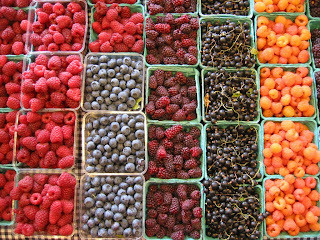 When selecting berries, note that the darker they are, the more anti-oxidants they have. "I tell everyone to have a serving (about 1/2 cup) every day," Dr. Kulze says. "Frozen are just as good as fresh." Be sure to include lots of other fruits and vegetables in your diet as well. Remember too that, in general, the more color they have, the more antioxidants. This is why I chose to alter my diet and lifestyle when I had high cholesterol, instead of depending on drugs!